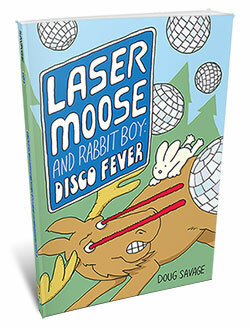 Laser Moose and Rabbit Boy return! This time they take on a potentially evil chickadee, a truckload of disco balls, and their nemesis Cyborgupine! Published by Andrews McMeel Publishing. Full color, 144 pages. 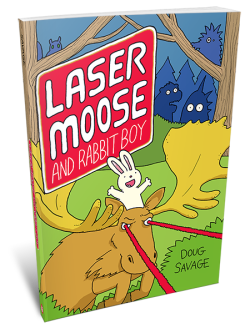 Doug’s first graphic novel, featuring a moose who shoots lasers and his intrepid rabbit sidekick, who save their forest from all sorts of dangers: aliens, a mutant bear, a cyborg porcupine, and more! Published by Andrews McMeel Publishing as part of their AMP Comics for Kids series. This e-book collection features Doug’s favorite 50 movie-related 3” x 3” cartoons, from The Wizard of Oz to The Life of Pi. Featuring 24 Oscar nominees, fourteen of them winners, and two for Best Picture. Published by GoComics and Andrews McMeel Publishing. 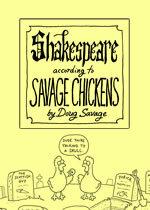 You haven’t seen Shakespeare performed properly until you’ve seen it paraphrased by chickens. This 50-page e-book collection features Doug’s favorite Shakespearean riffs – and he’s even written a sonnet as an intro! 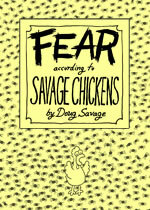 This terrifying e-book collection features 50 comics about the fears that are near and dear to Doug’s heart. It’s full of Doug’s favorite fear-related cartoons from eight years’ worth of anxiety, paranoia, and spiders. Hand-picked by Doug from the first eight years of Savage Chickens comics, this e-book collection has 50 of the best of Savage Chickens comics on 3″ x 3″ sticky notes, featuring Doug’s favorites and reader favorites. Fifty of Doug’s favorite cartoons on the topic of relationships, revealing everything he does (and mostly doesn’t) know about love. Drawn with love on 3″ x 3″ sticky notes. Another e-book from the fine folks at GoComics and Andrews McMeel Publishing. Brainnnnns. Eight years of tasty zombie cartoons in a single e-book. These 50 cartoons will not adequately prepare you for the zombie apocalypse, but they will provide some amusement while the horde closes in. The ultimate tongue-in-cheek guide to surviving a crappy work environment, including 65+ pages of exclusive new cartoons! Published by Perigee Books, a division of Penguin USA.